The Commander picked me up this morning and headed down to the mouth. On our drive we notice a bolt of lightning in the distance and hoped it would not affect our morning. We left the access point and started our hike. 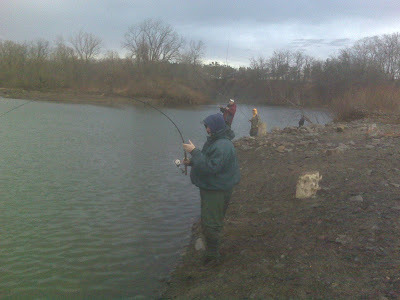 The weather was mild with a warm breeze and I hoped the water would hold off so Tom could get into fish. I surveyed our final destination and the water was a nicer green than the day before. There were a few fish jumping around so we got down to business. Well shall I say the Commander got down to business. He got into a few skipper chromers today on his magic pink worm. His action was steady enough to keep him happy. I on the other hand just stood there and wacked it. I tried various colors of sacks ,eggs , and pinkies to no avail. But I had fun watching Tom smile with his hook ups. 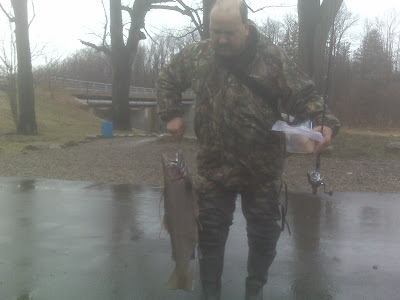 There were some other fish caught on jigs by others including a few bass but it was not a gangbuster day at all. The weather was definately something to watch today . As I stated previously, we started out with warm breezes. The warm breezes then turned to light rain. The light then turned to a heavy cold rain and we both got a good soaking. There are times when your on the water when you are gifted to see mother nature do her thing and today was one of those. Everyone had left with the cold rain and it was just Tom and I. We heard what sounded like a freight train coming from the west. The sound was the cold wind howling her way down the lake. The winds started ripping from the West- Northwest direction. The current started acting wacky as we heard the wind in the distance. The flow reversed and righted herself about 3 different times and at times a whirlpool happended. As the front raged on top of us, the lake level rose and water surged in from the lake bringing with her logs and debris. The clarity turned from green to brown and rose about 2 feet in depth. The temperatures dropped so we decided to walk back to the access point as the cold wind numbed our hands. We were greeted at the access point bridge by to fisherman. They asked if we were all right. we said yes and asked why. They said they were fishing under the bridge when out of no where a large wave came upstream raising the depth by 2 1/2 feet. 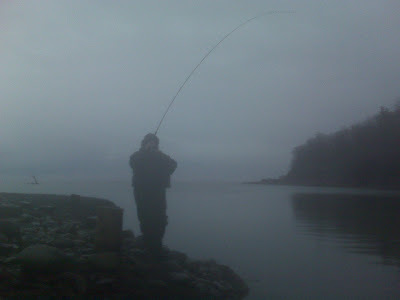 The wave almost swamped thier hip waders and started washing thier roe containers , nets and tackle away. They were able to recover thier items luckily. 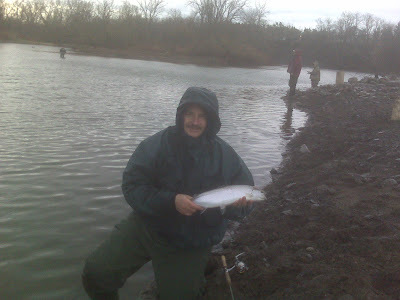 The one gentleman said he caught a nice male under the bridge on of all things and ice fishing jig under a float. Here is a picture of the guy and his buck destined for the smoker. Too bad it was a really nice fish. Wow...sounds like a pretty severe weather event. My guess is a "Seiche"
There was a huge 4ft one back in 1995 on Lake Huron. Yes that was the word I was looking for! Thanks again for an enjoyable morning on the water. My pink worm skills have been honed by you sensei. We need to get you a better camera for those "Money shots".